Rediff.com » Movies » Bond girl to play Aung San Suu Kyi? Bond girl to play Aung San Suu Kyi? Hollywood star Michelle Yeoh is apparently planning to play Aung San Suu Kyi in a film about the Burmese pro-democracy leader. Yeoh visited Suu Kyi to discussed the plan and both "had dinner together Monday night", Suu Kyi's lawyer Nyan Win said. 'I understand she is planning to play her in a film in the near future,' the BBC quoted the lawyer as saying. The Malaysian actress is best known for her role in the 1997 James Bond film Tomorrow never Dies. Yeoh was also seen talking to Suu Kyi and her younger son Kim Aris at Rangoon airport on Tuesday as both the actress and Aris were waiting to board planes to leave the country. Aris had arrived in Rangoon on November 23 and seen his 65-year-old mother for the first time in a decade. Aung San Suu Kyi was released from house arrest on 13 November -- less than a week after the country's first election for 20 years, which was widely condemned as a sham designed to consolidate the military rulers' power. The Queen of Soul Aretha Franklin, who is suffering from pancreatic cancer, has less than a year to live, according to reports. 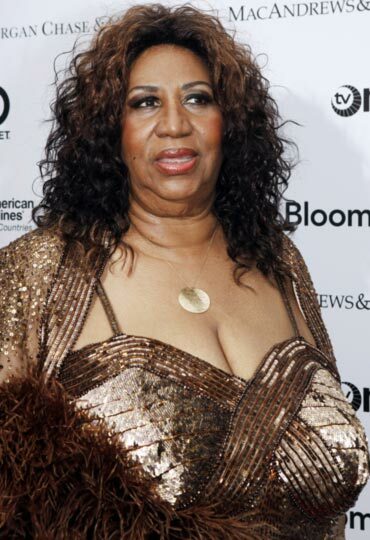 The Respect singer, 68, is suffering from incurable advanced pancreatic cancer, a US magazine claimed. Her family confirmed she had the disease but refused to give details or discuss her prognosis, reports the Sun. Family and friends are "very concerned" but said she is doing well. The Starr Report has learned that Gaga bested finalists Charlie Sheen, Mel Gibson, Lindsay Lohan and Miley Cyrus for the highly coveted honour, bestowed each year by the popular entertainment show anchored by AJ Hammer and Brooke Anderson. 'The key was that the mention of Lady Gaga's name sparks a visceral reaction,' the New York Post quoted the show's executive producer David Levine as saying. 'And she's had the most continued interest among all the nominees. She became the first person to reach 1 billion [views] on YouTube and she has 6 million followers on Twitter. 'She's given passionate speeches at the Don't Ask, Don't Tell rally in Portland [Maine] and her plea to end bullying had an impact. She also revealed that she has Lupus and then there was 'the finger' incident at the Mets game. 'She also has a hit album. Her reach is immeasurable,' Levine said. Levine said roughly 40 HLN and CNN staffers vote on the 'Most Provocative Celebrity of the Year' selection -- and only four votes went for Lohan. 'The day before we voted, it was down to Lohan and Charlie Sheen. It was a little obvious and I sent out a note to everyone telling them it was their last opportunity [to nominate someone],' he said. 'Somebody threw Lady Gaga's name into the ranks; we hadn't really discussed her...and when we told AJ and Brooke, they were like, 'That's a no-brainer,'' Levine added. Britney Spears snared the honour in 2006 and 2007, with Sarah Palin winning in 2008 and Jon Gosselin in 2009. In an interview, actress Kirsten Dunst has opened up about her rehab experience. Two years after she checked herself into the Cirque Lodge Treatment Center in Utah, Dunst has talked about her struggle with depression. 'I know what it's like to lose yourself, to no longer know the difference between right or wrong,' US magazine.com quoted her as telling the December 2010/January 2011 issue of BlackBook. According to the actress, coming to terms with her own personal demons allowed her to more fully embody her character in All Good Things (in theaters December 9). 'I was ready to play something like that,' she explained. Still, Dunst admitted that the attention surrounding her 2008 rehab stint made her wary about getting back into the spotlight -- particularly because she was falsely accused of seeking treatment for drug and alcohol abuse. 'I used to assume that I'd [continue acting] forever, and then there came a point in my life when I was like, ''Why am I doing this at all?''' she recalled. So why did the actress, who is currently dating Rilo Kiley drummer Jason Boesel, decide to finally share her story? 'On a personal level, I would talk to anybody about it, but not on a public level,' Dunst explained. 'If I do that, then the next person feels like they can ask me about it, and the person after that, until everyone then feels entitled to ask me about it, and that's not coming from a good place,' she added. Celine Dion has finally unveiled her newborn twins to the world by posing for pictures in the latest issue of People magazine. The singer delivered the baby boys, named Nelson and Eddy, at a hospital in Florida in October (10) after a long struggle to conceive with her husband Rene Angelil. The My Heart Will Go On star is seen in an intimate selection of snaps with the six week olds at her Florida mansion and she also talks of her pride at having endured such a long and painful process to finally welcome the boys. 'The love and what I feel inside, what we have accomplished -- I don''t know how to put it into words. It's bigger than life itself,' the Daily Star Quoted her as saying. The couple's nine-year-old son Rene-Charles is also seen with his new siblings, cradling them in a pile of red pillows in one picture. 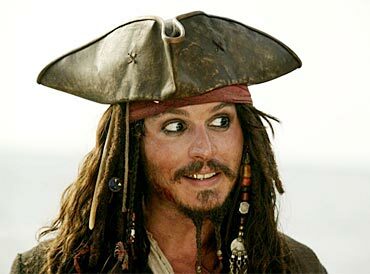 Pirates of the Caribbean star Johnny Depp may be finding it hard to come out of his reel-life character Jack Sparrow -- because he hasn''t yet found a dentist to remove the false set he wore for the role. The Hollywood actor has spent the last few months filming 'Pirates of the Caribbean: On Stranger Tides' and he has been wearing unsightly semi-permanent dentures for his portrayal of Captain Jack Sparrow. The star has been forced to promote his new movie with same teeth, as he hasn''t yet found a dentist to remove the false set. Depp has now hit the promotional trail for upcoming thriller 'The Tourist' and has been attending red carpet events and interviews with a crooked smile. "I will have them in until I can find a dentist to rip them out, essentially. They sort of have to be yeah, yanked out... we just literally finished filming like, you know, last week," the Daily Express quoted him as telling Access Hollywood.